Today I’m sharing a card I have created for the Papercraft Business Challenge Blog! Stay tuned at the end of my post so you can learn more about the Challenge and if you’re interested, come play along! I’ve shared in a previous post that I was chosen to be one of the DT members and I’d love for you to check it all out! To start this card, I cut two A2-sized panels from some 110lb cardstock. One of the panels went through my diecut machine with a Sizzix circle die because it’ll act as a window for the stamped images when I assemble the card later on. For the ink blending, I got my inspiration from the cool pictures I see about the Northern Lights. I used Tim Holtz Distress Oxide inks in Cracked Pistachio, Broken China, and Iced Spruce for the base layer and top layer. To prevent harsh lines between the ink colors, I used a light hand when doing my blending (in a circular motion starting off of the panels) and I would go over the “boundary” (where the two colors would meet) to soften the transition between them. I used the snowflake images from Lawn Fawn’s Beary Happy Holidays stamp set in Simon Says Stamp White pigment ink to stamp both panels. I chose a pigment ink because it would give me a grace period of staying “wet”, so I would be able to apply Perfect Pearls powder on top! I used one of my spare paintbrushes to dust a fine layer of Perfect Pearls on top of the stamped snowflake images. I brushed the powder back and forth lightly over the image until the pigment ink was covered. I took a Swiffer cloth to lightly buff away the excess powder. It’s a bit of a mess and will migrate onto you, but I can deal, ha! I’m not an expert on Perfect Pearls but I have seen other crafters use a water mister to help “set” the powder, so I held my mini water mister about a foot away and did a couple quick spritz. If I didn’t “set” it like that, the powder can smudge off. If you check out Jennifer McGuire Ink on YouTube, she has fabulous videos explaining this product and other techniques that work well with this product! As I let those panels dry, I worked on my two polar bear images. I stamped the polar bears using an alcohol friendly ink because I knew I would be coloring with Copic markers, which are alcohol-based. For my white polar bear, I colored his scarf using BG15 and BG18, with his ice skates in BG15. I used R22 to create some pink cheeks and their inner ears for both bears. For the other bear, I used E00 as her overall body color, with E77 for her ice skates, and R22 for her scarf. I used my Sizzix Big Shot to die cut the images out. Before assembling the finished product, I needed to stamp my sentiment and wanted to attempt a circular angle for it. That’s why I love my MISTI tool because it can help manipulate my sentiment’s shape (without doing stamp surgery!). My sentiment didn’t come out as black and crisp as I wanted (probably because of the Perfect Pearls in some areas) so I used my Papermate Flair tip to go over the sentiment. Finally, I adhered the panels together using my Tombow adhesive tape runner. I wanted a bit of dimension, so I adhered one of my bears with foam tape. I put the finished piece on a gray cardbase, slightly wider than an A2-sided card. I hope you are inspired to create a seasonal card or crafty project. Come enter the Papercraft Business Challenge blog this month, we’d love for you to join us! For the complete set of rules and information, come visit the Challenge Blog here. All papercrafters are welcome to play, submitting papercraft projects such as cards, scrapbook layouts, mixed media, planner spreads, etc! We’ll have one winner per challenge (with a prize) and a Top 5 nominated by us DT members! December’s Prize is this Magnolia Designs- Christmas Eve Edwin stamp! I used my MISTI stamping tool and MISTI Creative Corners to draw a faint diagonal line to be able to line up the sentiment, Doing My Best. I haven’t done rainbow stamping in awhile, so I stamped the sentiment out in ROY G BIV fashion, using the inks Lobster, Carrot, Sunflower, Fish Tank, Sugarplum, and Fresh Lavender. Surrounding the rainbow sentiment, I decided to stamp the other images and words in Manatee ink to help accentuate the stamped sentiment. That’s basically the rest of the card! I was itching to do more to the card but I couldn’t decide of any other embellishments. So I decided to go with a philosophy that can be hard for me to follow at times… less is more. Hello friends! I’d love to share with you an exciting and crafty announcement! YAHOO! I am THRILLED to announce that I have made it onto my very first design team! I am sure I will be posting more about this in bits and pieces but I’d love to share a few things already! 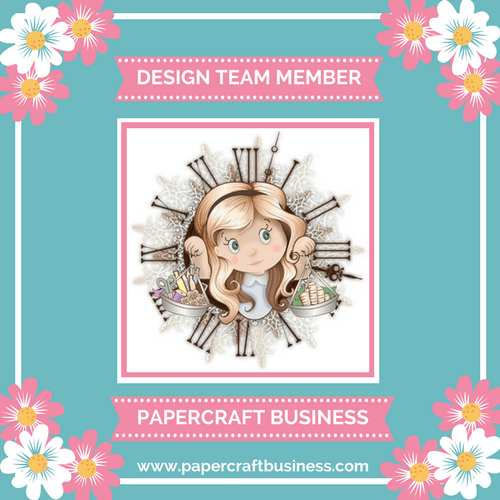 Papercraft Business is ran by Lisa Walsh where her mission is to provide papercraft bloggers helpful and valuable content to help them (including a relatively new crafter and blogger like myself!) grow their blog. Click here to check out the website. Don’t forget to check back often because more useful and fun things will be shared! One thing that drew me in is how information is shared in an inspiring and friendly way. Papercraft Business will be hosting monthly challenges over on the NEW Challenge Blog once a month, starting in December. Click here to learn more info but don’t worry, more information to come in the upcoming weeks! I’m so honored to have been chosen and I can already tell with my beginning interactions with Lisa and the other DT members, I will learn and be inspired by each and every one of them! In the meantime, totally check out the Papercraft Business website because there’s already a lot of fun and informative articles and freebies being shared and planned! 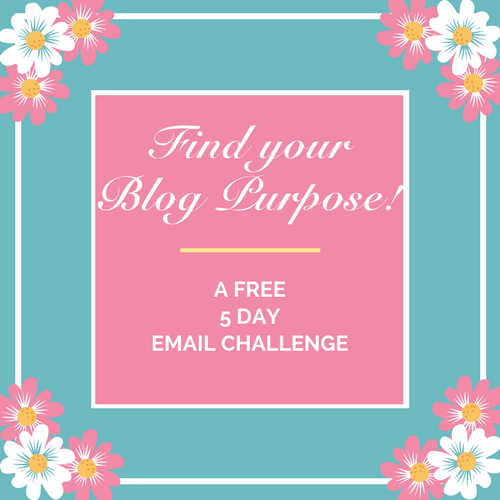 I’ve joined the Papercraft Business Facebook page and signed up for Lisa’s FREE 5 day e-mail course, Find Your Blog Purpose. If you’re new to me and Paper Tokens (hello! ), I’ve only been blogging and crafting since 2016. The opportunity to be a part of the Papercraft Business community AND the design team have come at the perfect time as I work on formulating my 2018 blogging and crafty goals! The first challenge will open in just a few short weeks (December 1st) so as we get closer, I will be sharing more information! Thanks for stopping by! When you’re feeling less than inspired to create or craft, what are some strategies you use to (hopefully) get your crafty mojo back? Some of the tricks I use are some of the same methods other crafters and bloggers I follow employ. I usually get inspiration from social media, primarily Instagram. Usually this method for me helps me think of techniques, color palettes, or card layout inspiration that I would like to do. I usually sift through my craft supplies to see what “speaks” to me after scrolling through Instagram. Sometimes it’s my patterned paper, embellishments, or my color media that gets the wheels turning. Quite frankly, sometimes I do these two methods and I still have no urge or inspiration to create. I just wanted to share that quick blurb to get new ideas from you or to give you a little more insight on how many (if not all) my cards come to be. For this card, I was looking through my paper pads and I unburied a pretty old DCWV (Die Cuts with a View brand) and I cam across the Gilded Paper Stack 12×12 paper pad. I was drawn to the paper that had gold foiled flecks and I decided to experiment and use it as my background for the card! I used Honey Bee Stamps Bless Your Heart stamp set, using the Blessed sentiment. First I used my EK Success powder tool to give the A2 sized card front a good coating of powder, since I knew I wanted to do heat embossing. I put the card front in my MISTI tool in case I’d need to do repeat stamping. I arranged the sentiment and used Versamark ink twice. I used Ranger Sticky Embossing powder and used my heat tool to transform the powder into a nice, shiny sentiment! I placed the card front into an old packaging box because the Tonic Studios Nuvo Gilding Flakes can get really messy! I took a pinch of some of the flakes, lightly laid it over the Blessed sentiment and then used my fingers to massage the flakes onto the embossed sentiment. I purposefully used Ranger’s Sticky Embossing powder because this powder can be used perfectly for this type of technique! I used my Tsukineko Stipple brush to really brandish the flakes into the sentiment. I wanted to have a little more detail on the card, so I pulled out another beloved Honey Bee Stamp set called Country Wreath. I used a few of the flowers, leaves, and wreath to create some interest below the sentiment. For my inks, I used Simon Says Stamp Dark Chocolate ink, Hero Arts Pumpkin Pie and Red Royal, and Lawn Fawn Doe ink.